TAHOE/TRUCKEE, Calif. – Truckee Wolverine Boosters would like to thank FiftyFifty Brewing Company for hosting a fundraiser where they donated a portion of their sales to the Boosters. Dave Green brought his talented band to entertain the guests, and a good time was had by all. The funds will be used for authorized student activities at Truckee High School. Thank you Andy and Alicia Barr!- Truckee Wolverine BoostersDog Day in the Park raises pretty pennyDog Day in the Park says thank you to all four-legged and two-legged community members who came to this year’s Dog Day in the Park! Thank you to all our generous in kind and financial sponsors: Audi of Reno, Plumas Bank, the Tahoe City Rotary Club, the North Tahoe Public Utility District, Sean O’Brien/Changoloco Productions, 101.5FM, Dave Lingensjo, Brett McDowell, Starbucks Incline Village, Friends of the Kings Beach Library, Bank of the West, Kings Beach United Methodist Church, Las Panchitas/Alex Brambila, Lucky Dog/Meredith Hobbs, Lucky 7 Tattoos, A Party House/Gwen Tyson, Pet Station, Jo-Mar’s, Northstar Deli, Porter Simon, Safeway Kings Beach, Rockwood Tree, Hooked Up, Sierra Boat, Ferrari’s Crown Motel, the Tahoe Business Exchange, Taneva Auto Parts, Thunderbird Lodge, Lone Eagle Grille, Diamond Peak Ski Resort, Incline Village Mountain Course, Waste Not, Tahoe Vista Inn, Captain Jon’s, John Bergmann/Printart, Uncorked, Mickey’s Big Mack Charters, Ted Guzzi Photography, N.T.B.A., Jazzercise, Paragon Pest Control, Frederick Carpet Care, Tahoe MountainSports, Jason’s Beachside Bar & Grille, Spindleshanks, The Franciscan, Steve Schmiers Jewelry, Blue Agave, North Shore Hardware, Village Market, the Wylie Animal Rescue Foundation (WARF), Placer County Animal Shelter, Kings Beach Scraps, Tahoe Scraps, Tahoe House, Tahoe “C” Company, Tahoe City Golf, Sweet Peas of Tahoe, North Lake Massage & Skin Care, Betty Mueller, and the Epstein, Kohler and Landis Families and many, many more! Thank you to our wonderful volunteers including the Boys & Girls Club of North Lake Tahoe “Green Team” and Boy Scout Troop 37 Incline Village, for all your work preparing and participating in Dog Day. 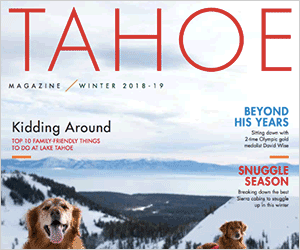 Thank you to the Sierra Sun, North Tahoe Bonanza, and The Weekly for publishing announcements of Dog Day. The financial accounting is still being done but it looks like this community raised $15,000 for our dogs! – Pamela Berger, Kelly Borelli, Ramona Cruz,Meredith Rosenberg and Linda Slack-CruzCommunity Thanksgiving Dinner appreciatedI want to thank Meera Beser for allowing me, a new resident of a whole two weeks here in Kings Beach, who would have spent Thanksgiving alone if not for such a well planned event that brought the community together on equal grounds to share a great donated meal together. Most of all we got to share a thankful moment together with others.In the week that I volunteered with Meera I witnessed random acts of kindness that would exceed anyone’s expectations of Holiday giving. Endless donations came in from the hearts of the givers, expecting in return only to know they improved others lives by giving. The many people who called her and volunteered came with Happy hearts after she asked each person to volunteer only for what they felt they would enjoy doing. There’s nothing better than to work hard beside someone who too is having so much fun working hard you forgot you were working and making new friends in the process.I have never met anyone quite like Meera, who has the ability bring so many caring people together and produce such an amazing outcome of pleasing and uniting a community as a whole, what a gift she has been blessed with!I hope even more people volunteer and attend next year and make the Community Dinner a new tradition and a way of giving back which will continue to make the Kings Beach community even stronger. It’s important people know if you can’t volunteer there are many ways you can help next year’s Dinner be even bigger.When you see the advertisement call Meera and ask “What can I do to help your Dinner grow?” I hope those who also were touched and blessed by the Dinner as I was will let Meera know her hard work and commitment to serving others is indeed a blessing.- Lori MellonThanksgiving feast wonderfulI went to the North Tahoe Event Center for their Wonderful Thanksgiving Feast, on Thanksgiving day. So much food, and soooo tasty.It was great to see so many volunteers there. I personally love volunteers. They are the best people to know. They give so much.It was so much fun just to see people so happy. Thanks to Meera for putting it on again.God Bless,Love Wilma Project MANA thanks community for successful Let’s Talk Turkey distributionOn Saturday, Nov. 17 Project MANA held another successful Let’s Talk Turkey Food Distribution! Thanks to more than 25 local businesses, social service agencies, schools and churches throughout North Lake Tahoe and Truckee, Project MANA reached nearly 700 families in need and provided each of them with a turkey and fixings for a wholesome holiday meal. Project MANA would like to thank each and every member of the community that helped make this year’s Let’s Talk Turkey Food Distribution possible. More than 60 volunteers donated their time and hard work to make this event a success. Without the generous donations of turkeys, canned foods and money that Project MANA received from so many local businesses and individuals, it would not have been possible to provide so many holiday meals to so many people. Thank you to everyone who supported Project MANA in the fight against hunger this holiday season.